The following is the first in a series of articles featuring the impact of the landmark anti-corruption law that took effect on Sept. 28. - Ed. The nation’s deeply rooted business entertaining culture is expected to go through a major change with the enforcement of the anti-corruption law Wednesday. There are mixed views toward the law’s potential impact on the economy and its role in building a transparent society. But expectations are high that the law -- known as the Kim Young-ran Act -- will help eradicate closed-door ties among public officials and business people, and also spread the virtue of establishing equal relationships by splitting checks. The law sets the upper limits for food, gifts and congratulatory or condolence money that public officials -- including government officials, journalists and private school teachers -- can receive at 30,000 won ($26), 50,000 won and 100,000 won, respectively. Those who receive money or gifts worth more than 1 million won at a time and 3 million won in a year from those related to their work, will be subject to violation of criminal law. However, concerns linger over its impact on domestic consumption, particularly in the entertainment, food and retail sector. To continue to attract consumers, hotels and restaurants have introduced new menus priced under 30,000 won and retailers have designed new gift sets in accordance with the law. But the reservation rates of restaurants in Seoul’s financial and legal districts, and those near government complexes in Sejong and Daejeon, have rapidly dropped. Golf clubs and luxury bars, including so-called “room salons,” are expected to suffer substantially from enactment of the law. The nation’s agriculture and fisheries industries are also likely to lose 900 billion won in sales per year, as the law prohibits receiving gifts that cost more than 50,000 won, according to the Korea Rural Economy Institute. Korean beef, dried yellow corvina and premium fruits make up the preferred gift sets for national holidays, such as chuseok and Lunar New Year. Nearly 90 percent of such gift sets sold at department stores exceeds the price limit, according to industry insiders. Building business relationships through expensive dinners and rounds of golf have for years been standard practice in South Korea’s corporate world. According to Rep. Kim Jong-min of the Minjoo Party of Korea, South Korean companies spent an estimated 9.96 trillion won on business entertainment expenses last year, a 6.8 percent increase from the previous year. In the report that quoted data submitted by the tax agency, he said a total of 591,684 companies spent 16.85 million won per year on average. Entertainment expenses spent by the nation’s top 1 percent corporates accounted for 33.5 percent of the total, he added. Limits on spending and renewed awareness of the need for a transparent society could transform the business entertaining culture, some experts said. But market analysts suggest that the nation’s economic growth rate will further drop, partly from the impact of the law. The Korea Economic Research Institute has estimated that economic losses arising from the law would amount to 11.6 trillion won per year. JP Morgan said in a recent report that Korea’s growth rate is likely to slow down in the fourth quarter of this year and the first quarter of next year due to the impact of the anti-corruption law. Companies say they are concerned about how to maintain business relationships they have built with government officials and the media over the years. 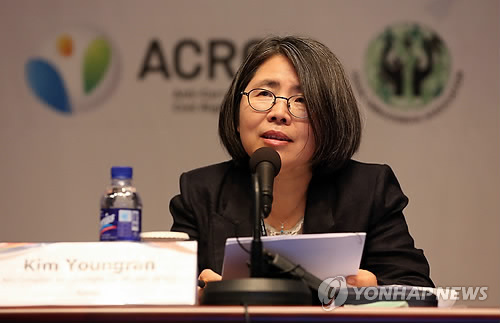 The law’s definition of those related to work is ambiguous, said a publicist at a business lobbying group in Seoul, as it excludes socializing as part of business formality. “We are at loss as to how to handle the media relationship, due to the ambiguity of the legal definition,” said an official who declined to be named, adding that companies will probably take a wait-and-see approach for a while.